What Tile Should You Use in the Bathroom? Tile Material: Might sound obvious, but not every tile material can go in every area of your bathroom. Pay particular attention to the tile you choose to use around your shower and drains; it’s vital that you choose a tile with some traction and one that is made from a bit harder material for easier cleaning. 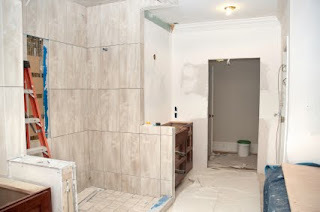 Choose a cement board or other waterproof backing before installing tile to ensure you have a solid foundation on which the tile can adhere; this will prevent mildew, rotting and the tile falling off. Tile Cut: Most contractors might say this is the trickiest part to retiling a bathroom - the tile cuts needed around showers and tubs can be the most difficult. Beyond a high quality, sharp wet tile saw, you’ll need a tile cutting tool like TileSizer to help you achieve such detailed and diverse cuts. For curved tile cuts around the drain, to diagonal cuts and more around the tub and shower edges, it’s necessary to have a versatile and professional tiling tool to achieve best results. Tile Placement: You can practically use tiles anywhere in your bathroom – so the choice is yours! When electing where to place individual tiles, keep in mind that the sturdier tile types (like porcelain tile and less absorbent natural stones) should be closest to the moisture-prone areas. Additionally, think about the kinds of traffic that will be crossing the tile. If it’s a highly frequented area, bright white might be the hardest to keep clean; however, in a bathroom, most of the traffic may be barefoot/cleaner than say, the kitchen or entry way. There is no right or wrong when it comes to tiling a bathroom, but it’s imperative to thoughtfully think out the whole design before committing. Because tiling a bathroom is the most tedious (so many variations of cuts! ), allocate enough time for the whole project so you don’t feel rushed or stressed along the way. For many of your home remodeling needs, choosing tile for the floor or wall makeup is a wise choice. Not only is tile an extremely sturdy material, but it’s easy to clean, lasts long and looks professional. Whatever area you tile, make sure to think about the wear-and-tear of that area, the traction needed (if any) and the clean-ability (maybe white tile isn’t the best option for a high traffic floor area! ). When you get to cutting and laying the tile, make sure to invest in an affordable tool for tile cutting) like TileSizer and make effortless, professional cuts.